I ended the last post with, “We’re ready for a few days of rest.” We found it. 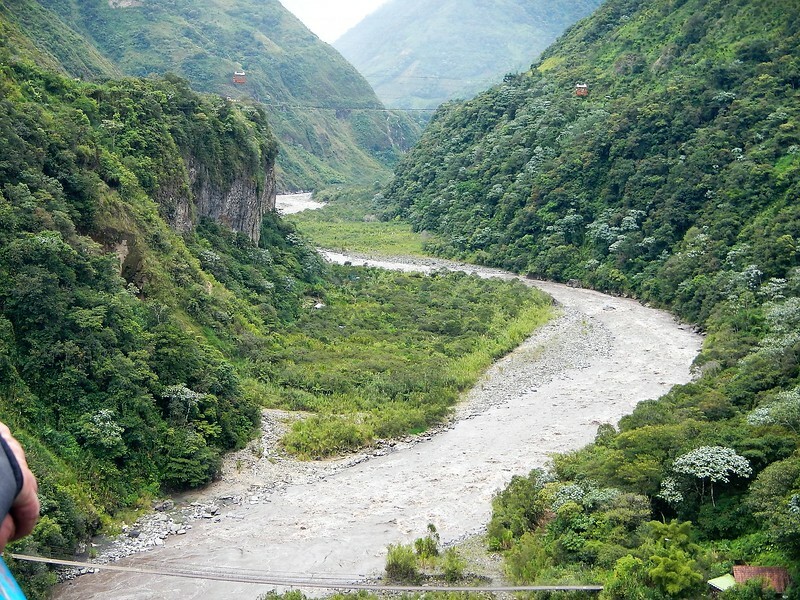 Once we crossed into Ecuador everything changed. What? Does the rain just stop at the political border? No, but we learned that Ecuador recently invested millions in upgrading its infrastructure to withstand the occasional years with heavy rain. It was still wet in Ecuador but the roads and bridges all seemed to have adequate drainage to deal with the flooded rivers. We were glad for that. 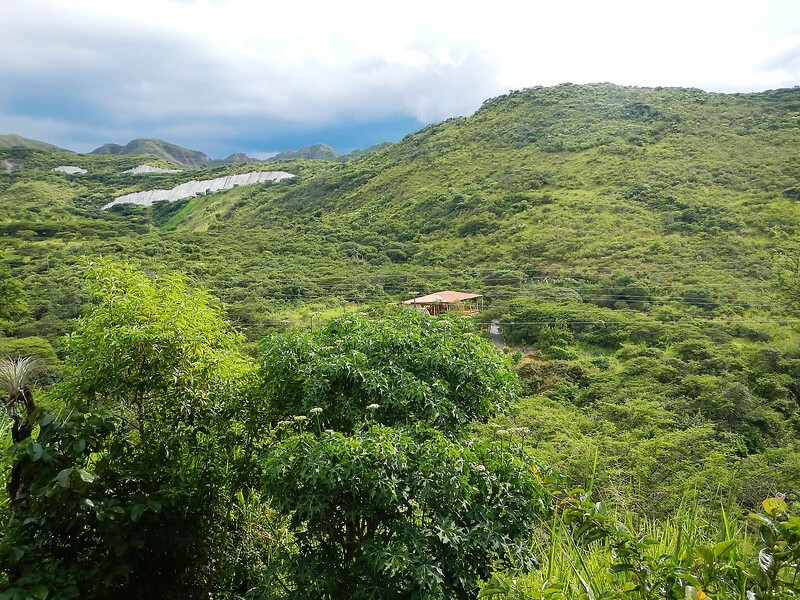 Located in a historical and scenic valley, it is a common destination for tourists, in part because it is widely believed that its inhabitants grow to a very old age. Locals assert that it is not uncommon to see a person reach 100 years of age and it is claimed that many have gotten to 120, even up to 135, which would make it an area with the oldest inhabitants in the world. It is often called the Valley of Longevity. Hmmmm, a place with a lot of old people. 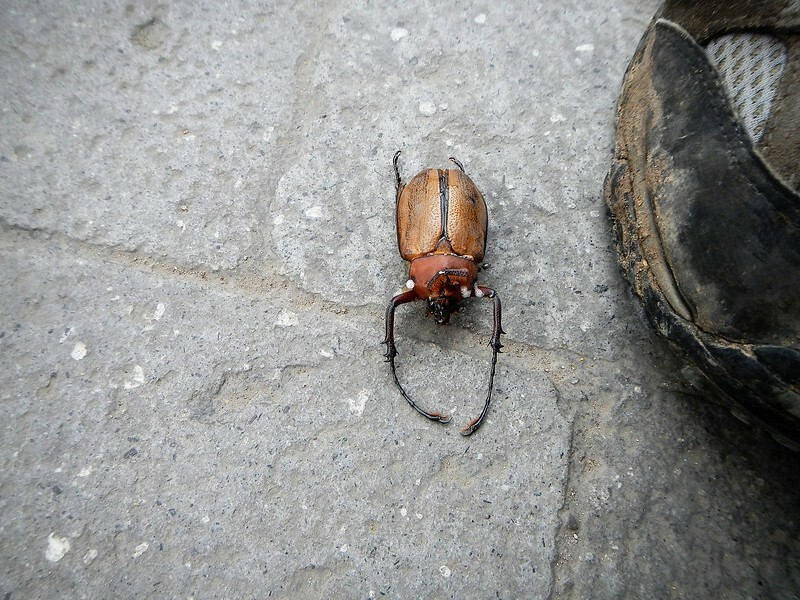 Ok, what the hey.. so off we went and rode the 50 mile trek through wonderful twisty roads through the green mountains to the fabled city of Vilcabamba. We had asked ahead of time about hotels and everyone recommended Hosteria Izhcayluma so we programmed the GPS and arrived in the early afternoon. Were we in for a surprise, this place was amazing. After what we had gone through in Peru we were looking for a place to rest and catch up on pictures and book reading. We ended up with our own cabana, when we walked in the front door and saw this I was hooked. 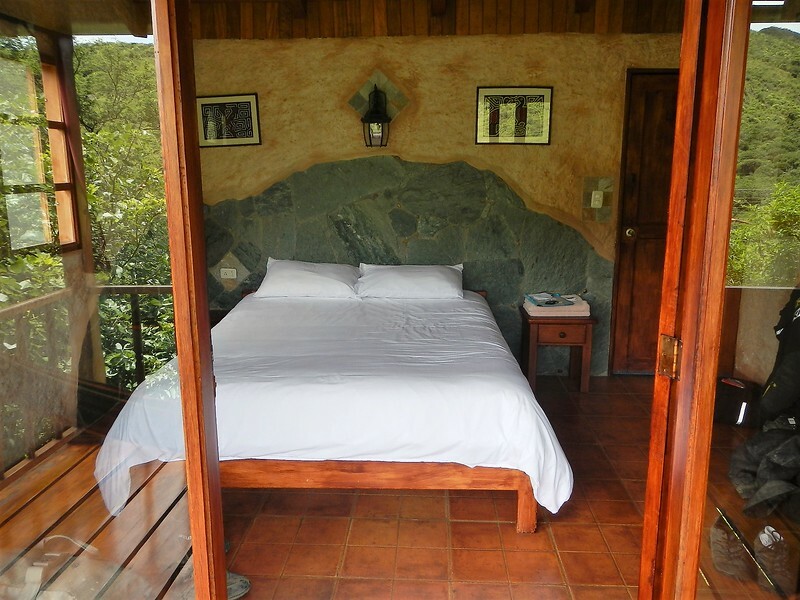 Turn around and here is the bed looking out the wall of windows into the mountain view. We were hooked. The bikes were parked, we were not going anywhere for three days. Warning…. no motorcycle stuff for the next few paragraphs. From the huge deck at the lodge this is the view of the city of Vilcabamba. 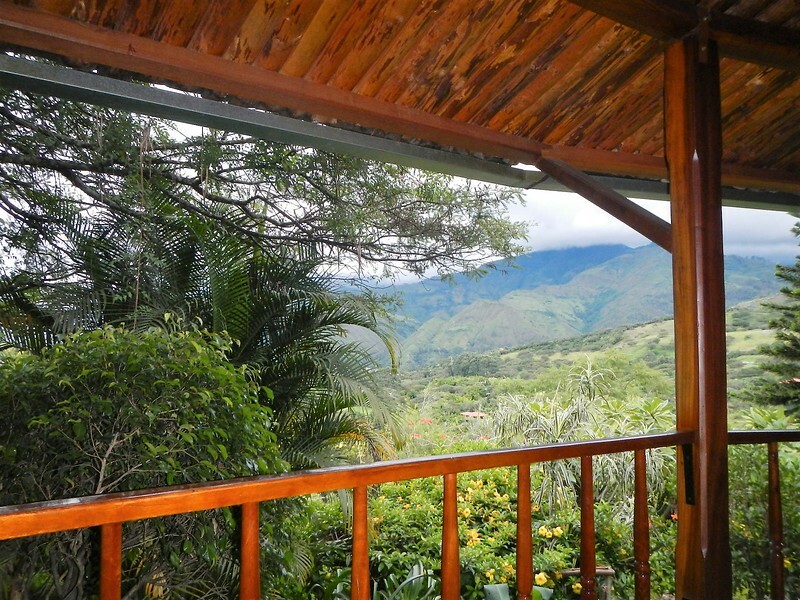 The restaurant and daily breakfast spot was on the outdoor patio with a spectacular view of the surrounding mountains. 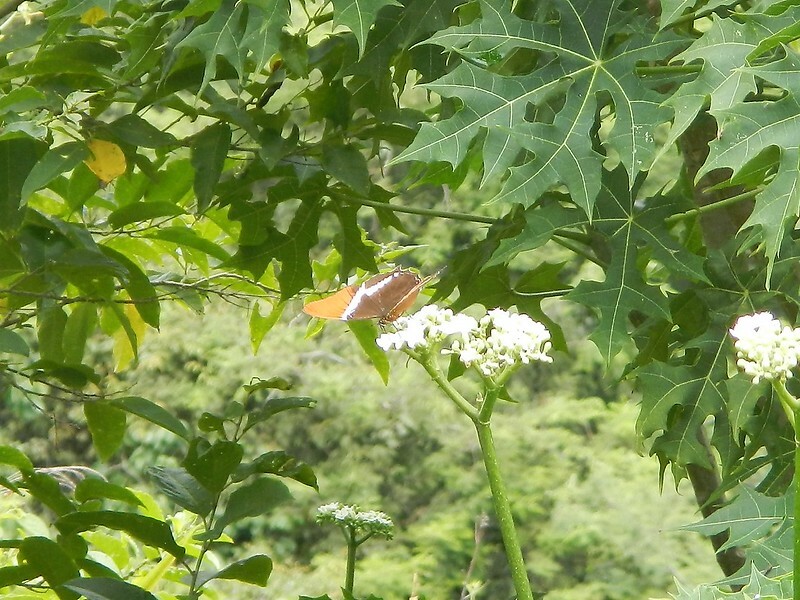 The tropical surroundings were teaming with birds, flowers, butterflies and amazing things everywhere we looked. 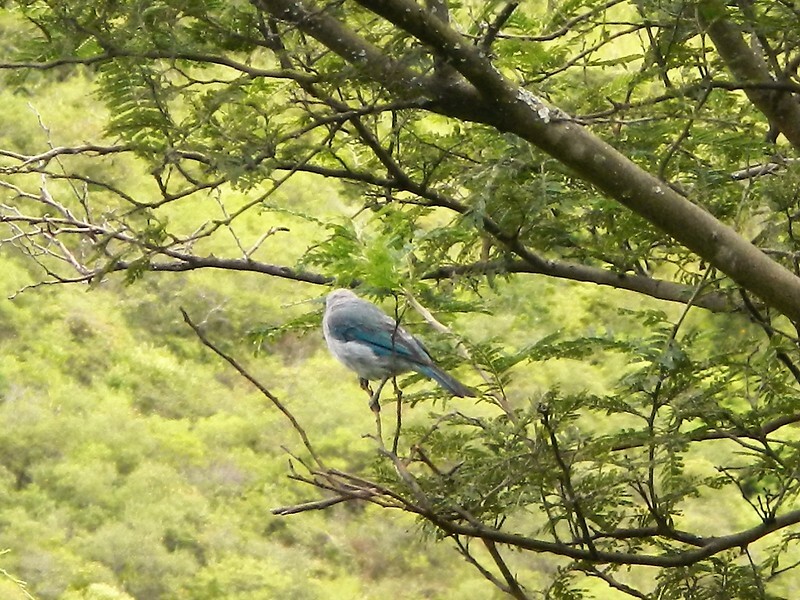 There were these blue birds..
A bunch of these brown birds that weren’t afraid of people and woke us up every morning with a loud song right outside our window. 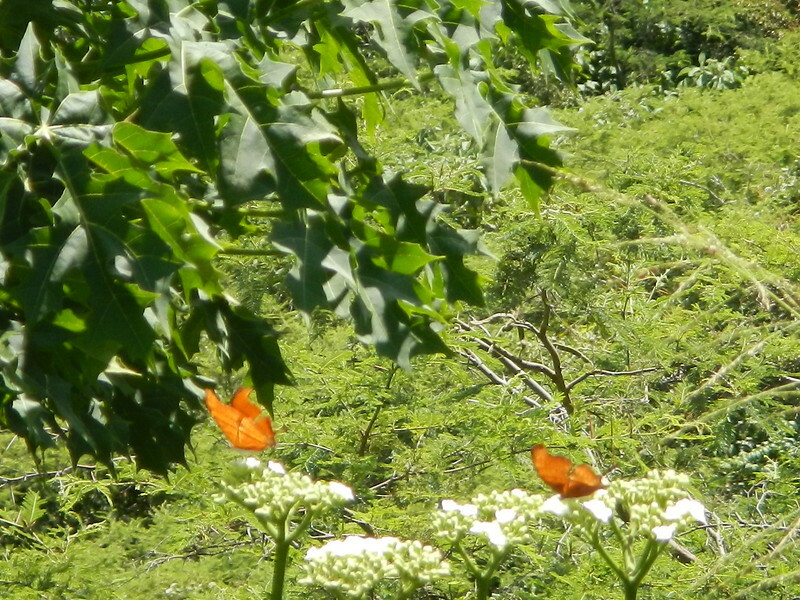 Brightly colored butterflies were everywhere and nearly impossible to get pictures of but here are a couple of tries. 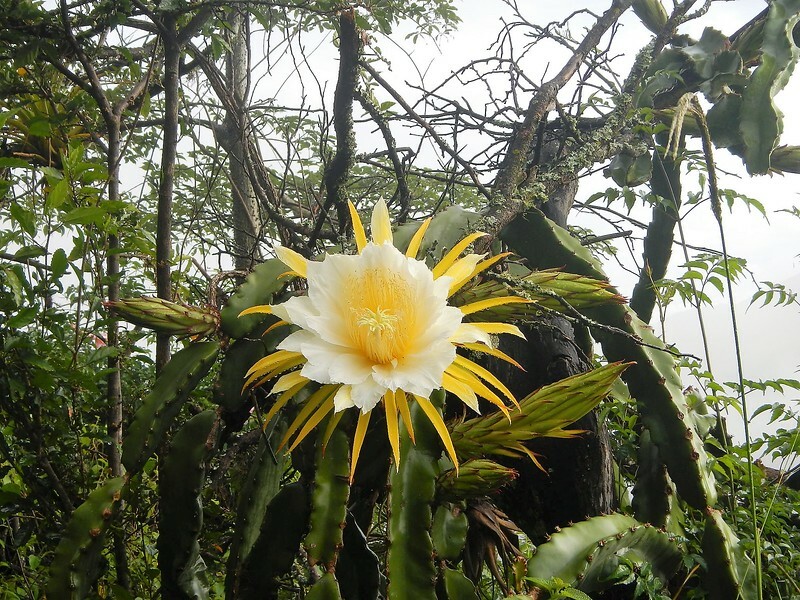 At breakfast someone pointed out this flower the Queen of the Night Orchid Cactus. 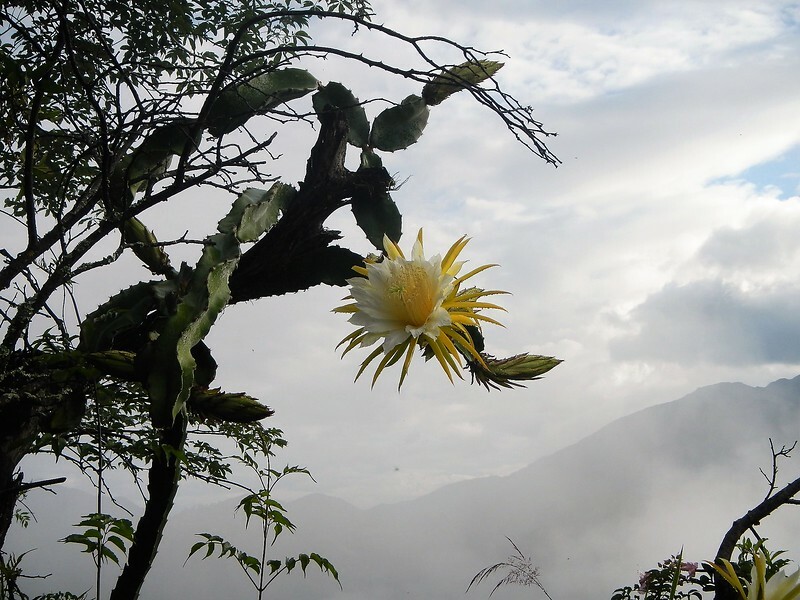 Click on the link if you want to learn more but in short, each flower on this plant only blooms once a year, at night. We caught it before it closed up in the morning. Amazing. 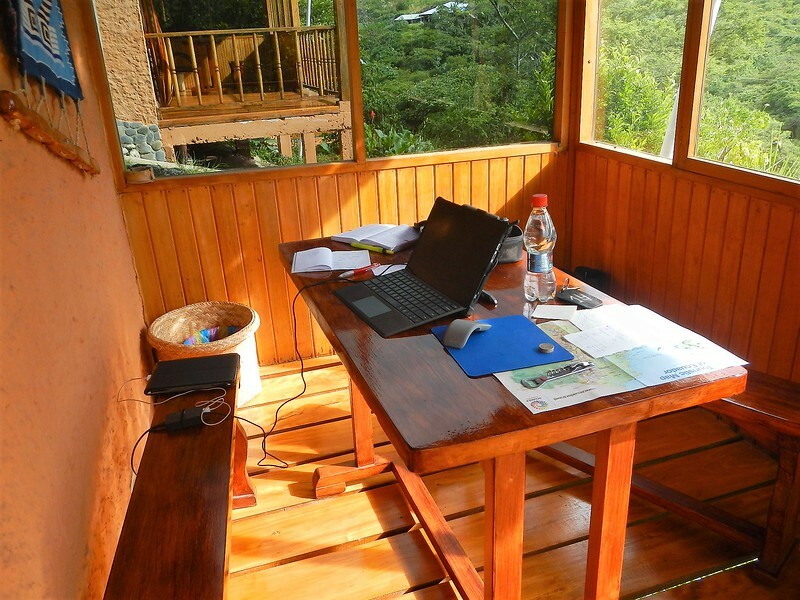 I set up a workstation to plan our time in Ecuador, rough duty. So we lavished in a few well deserved days of rest. Of all the places we’ve been this is high on my list of places to return to. Cuenca is another one of those cities that we were told to visit. It’s a colonial city in the southern part of the country complete with a beautiful main square and narrow cobblestone streets. Rested from our time in Vilcabamba we rode on great twisty roads the 160 miles to Cuenca arriving early in the afternoon. The weather had cooled off and we rode off and on in cool rain. We felt like we had been transported back to Seattle weather, 50’s and overcast with light rain. Ok, at least we knew what to do. The city didn’t really do it for us and I’m not sure why. 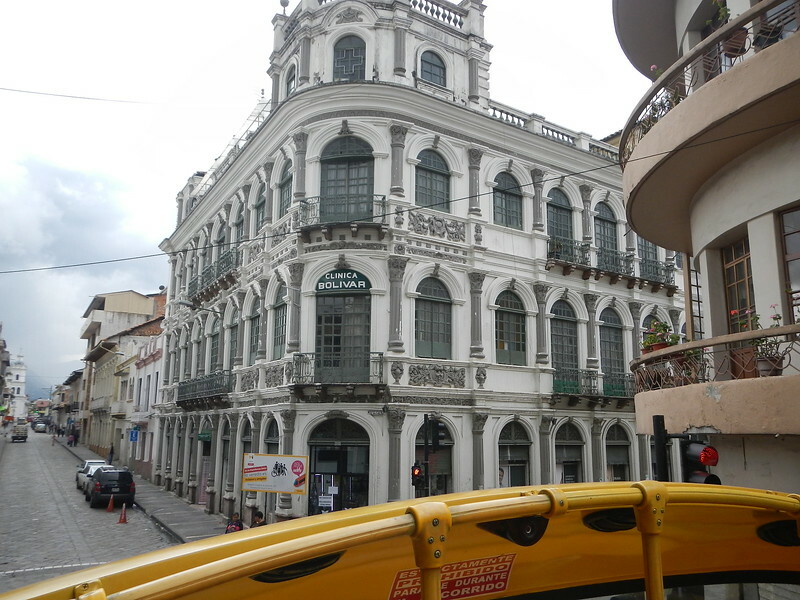 We checked into the Hotel Morenica del Rosario which was only a few blocks from the main square. Maybe it was the weather, cool, overcast with off and on rain. Our small room at the boutique hotel wasn’t very conducive to hanging out and reading books so we donned our rain gear and toured the city. For $8 we jumped on a tourist bus and took a few pictures from the upper deck until the sky opened up and a hard rain forced us below deck. 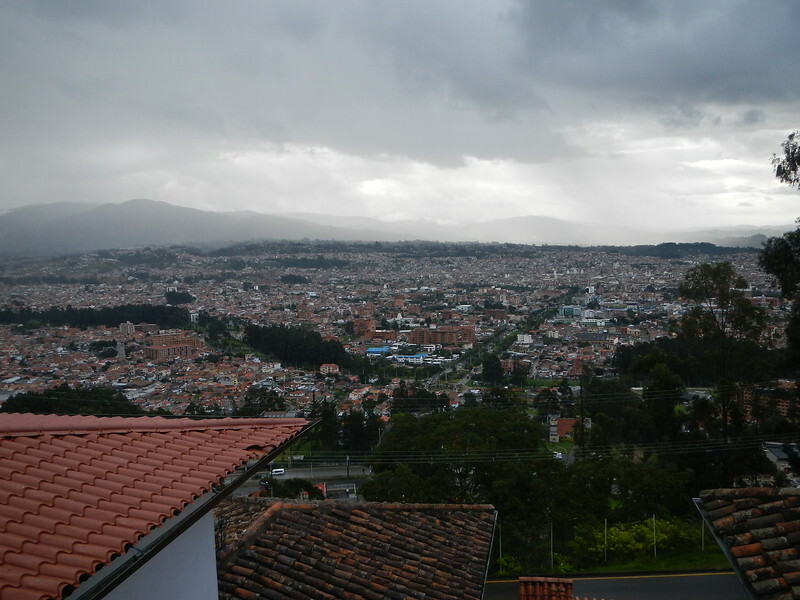 Went up to a viewpoint for an overview of the city and view of the clouds hanging in the nearby mountains. Along the way we spotted out the bus window what looked like a workshop with copper products. Hey – we convinced the tour bus driver that we had seen enough and to let us out for a walk back to the shop. 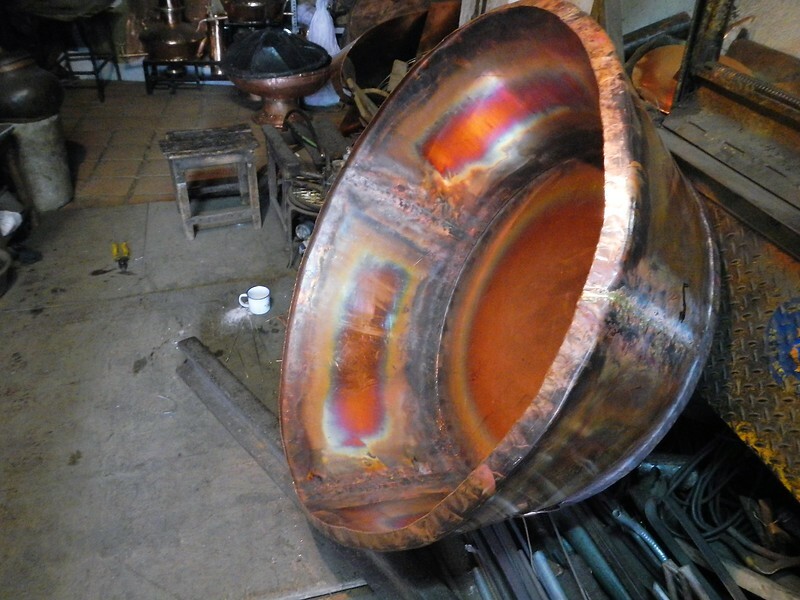 It was the shop of a fourth generation copper artisan, Juan Gutierrez Duran. How cool was that? We stopped in his small shop and were given a tour by Senior Duran himself. Even with the language barrier we had a great conversation and visit. When we got back to our hotel I found him on YouTube. Here is a short interview with him. 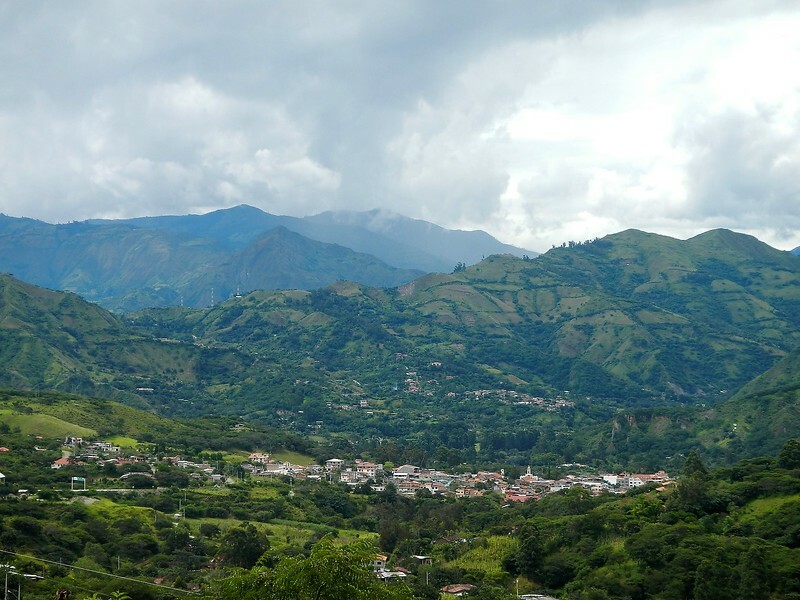 The plan was to next visit the touristic city of Banos a little further north. 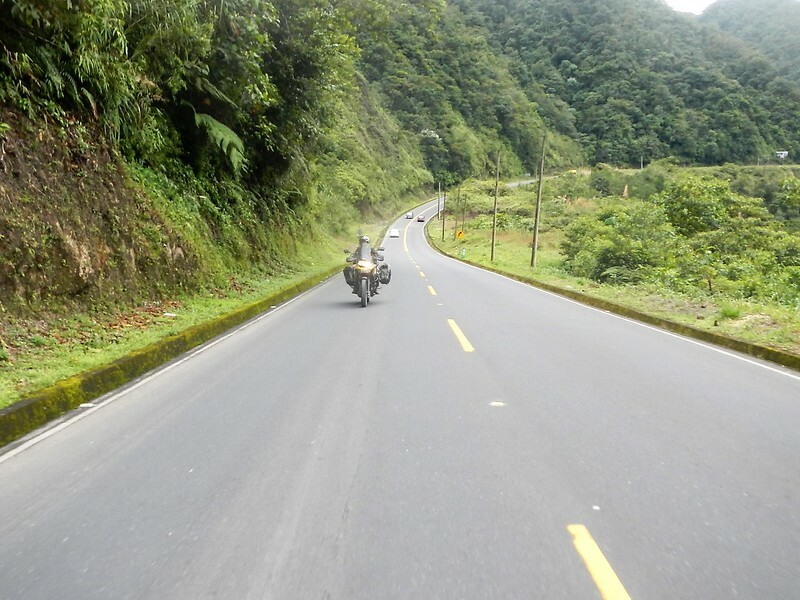 After researching maps and talking to people it was recommend that we ride east to the edge of the Amazon jungle and check out the lowlands of Ecuador. One problem, the road we were told to use didn’t show up as going through on Google Maps. Really? I like to check Google maps because I presume they are mostly up to date. 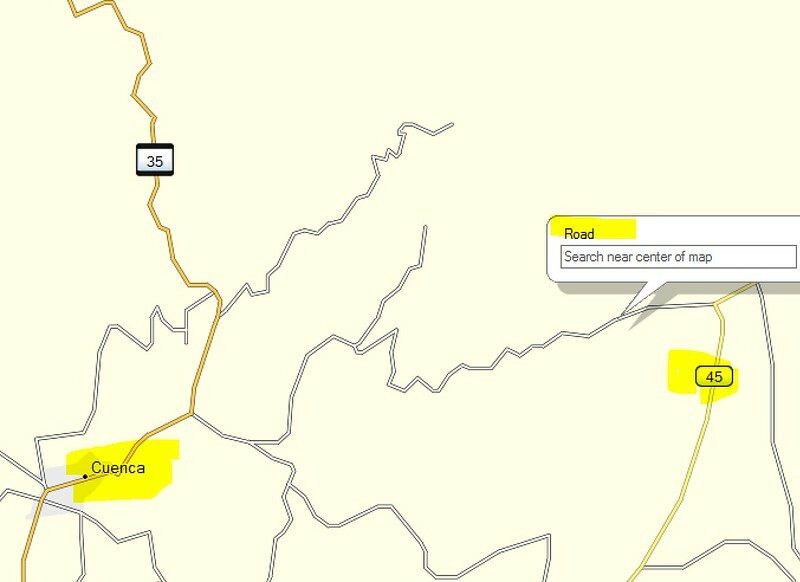 The screen shot below shows ruta E40 going east from Cuenca but not continuing to ruta E45 that goes north along the Amazon basin. Ok, I’ve found not to always trust maps, online or otherwise because it’s common for them to not be correct or agree. So what does my paper map say? 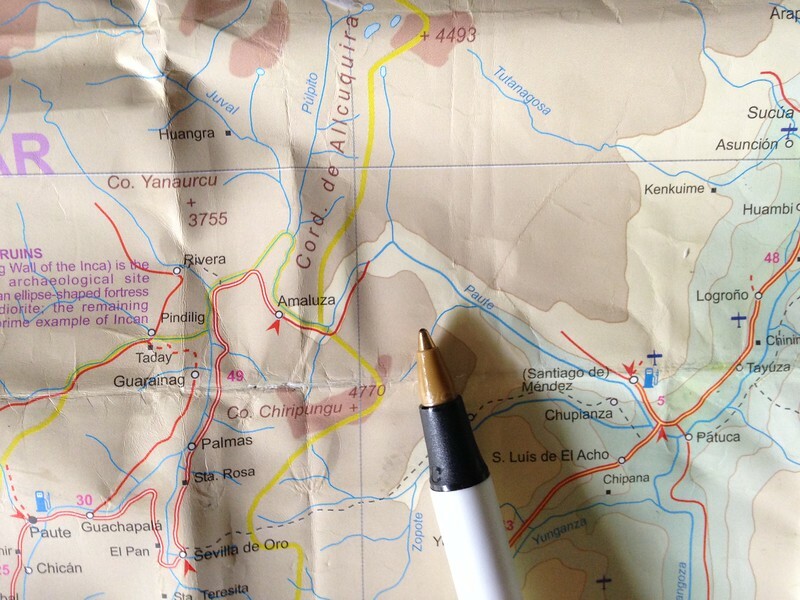 Below is a picture of that… the pen is pointing to a river but no road. Hmmmm. Ok, last resort… my GPS map that I downloaded for free from some website in Europe. I should be able to trust that right? Ok that does it… my free download map says “road”. 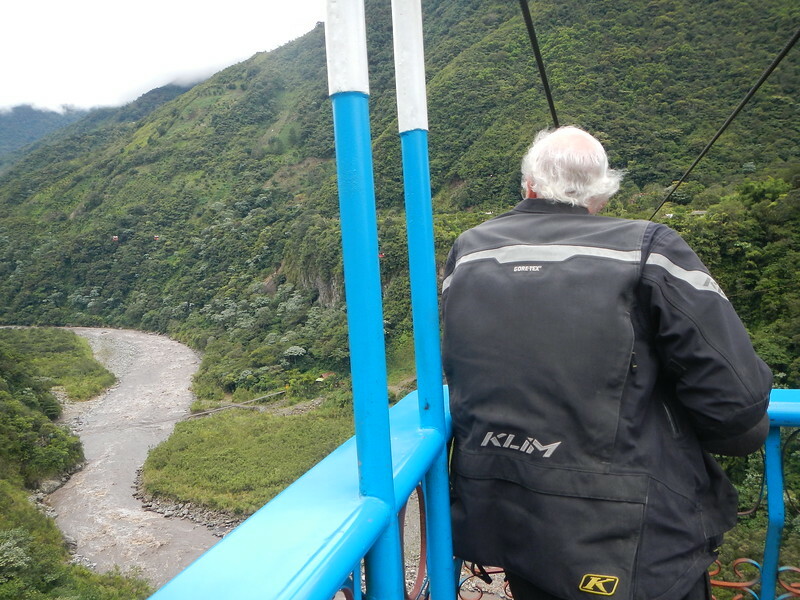 What’s not to believe so Deby and I launched off in the cold rain up into the mountains onto an unknown road and down into the Amazon basin of Ecuador, what could go wrong? The road climbed up over a small mountain range and then dropped into the wet edge of the Amazon basin. It rained nonstop and when it wasn’t raining hard it rained harder. I didn’t take many pictures but the road was 162 miles of tight turns on rain slick roads. We dropped from over 8,000 feet and the weather changed from cold and wet to warm and wet. We stopped to peel layers as we decended out of the cool hills. I was hoping the road continued as we got deeper and deeper into the mountains that felt more and more like think jungle. Somewhere along the way the line on the paper map ended but the pavement continued. We were glad for that. The road wound down deeper and deeper into the jungle and we were forced to go slow on the sharp turns and pay too much attention to riding and were not able to enjoy the scenery other than to notice the greenery was encroaching the road with every mile. We made it to Macas and found a place that rented small cabanas on the south end of town. It was nothing special. 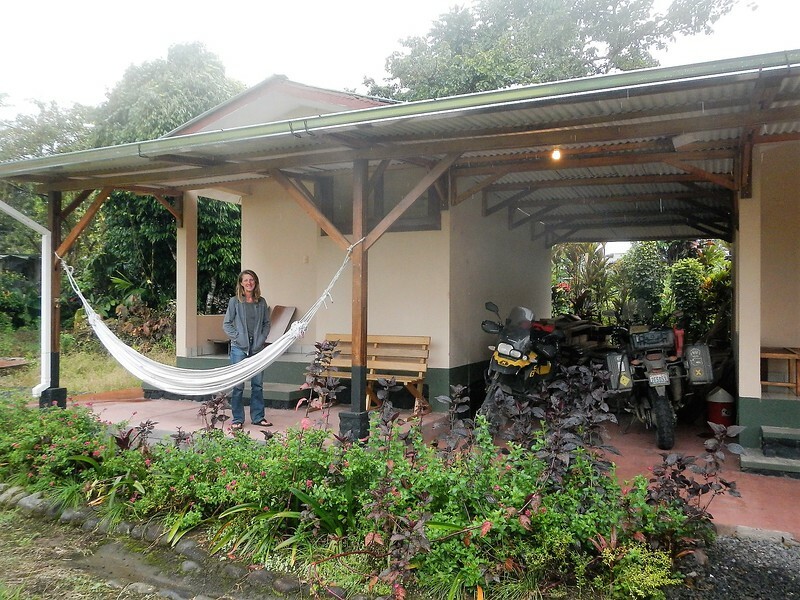 We were the only guests and were glad they had a restaurant and a small room with a hammock out front. At least there was a dry spot for the bikes, it poured rain all night long. 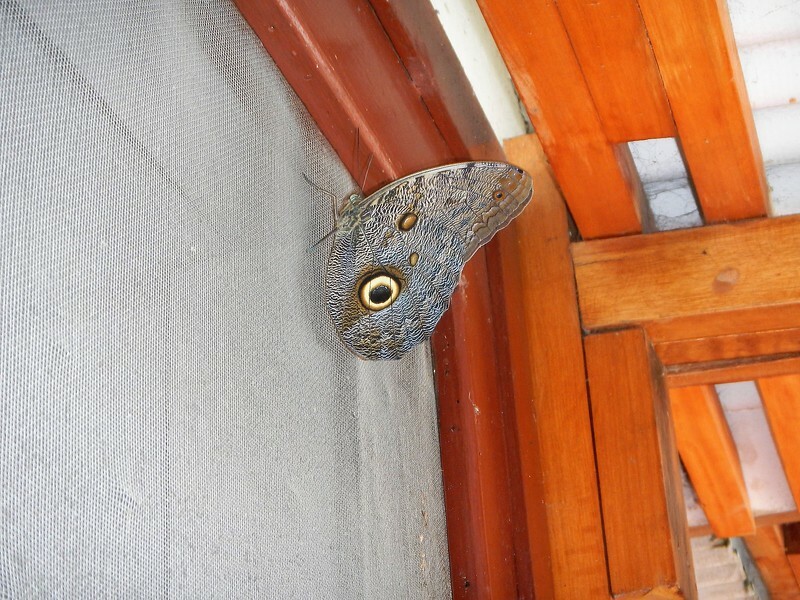 One thing about Ecuador is the size of the bugs… I took a picture of this moth outside our window. Here are a few others from the last few days. Here is one with my shoe as perspective. 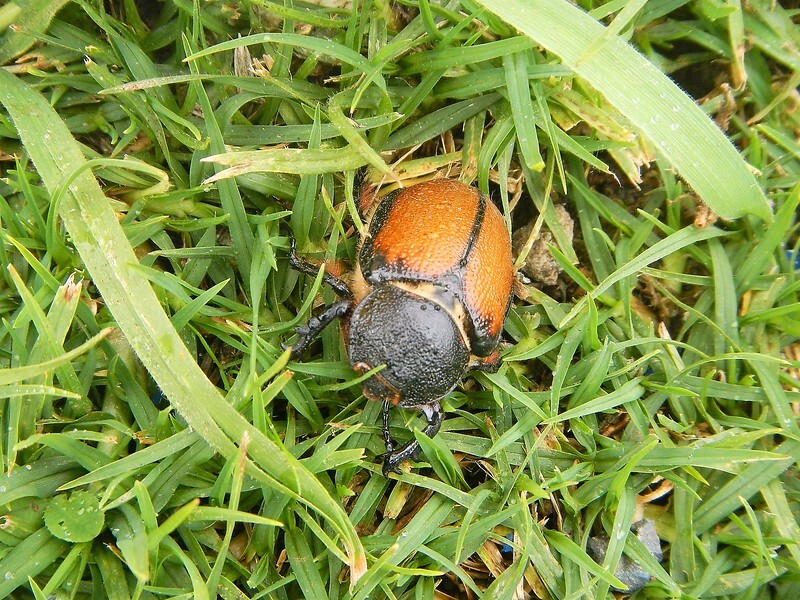 Nice looking guy in the grass. 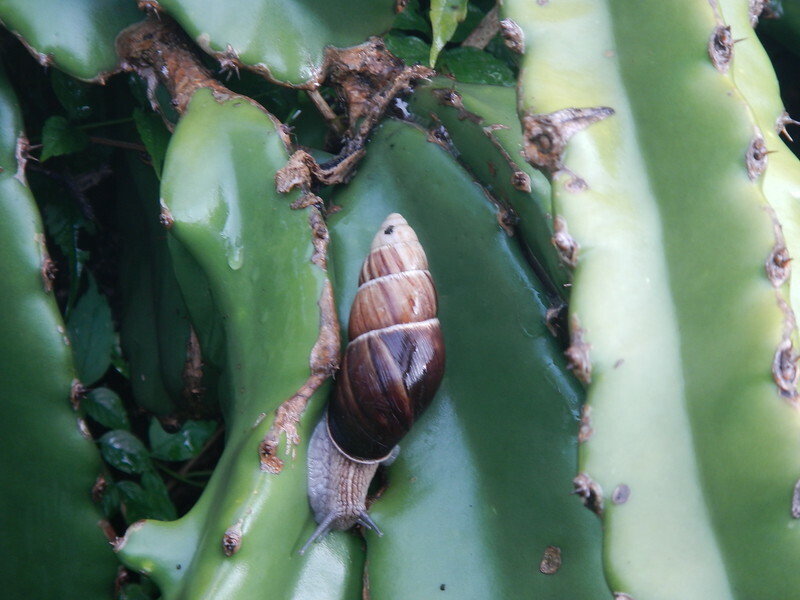 But the slugs/snails…. nothing compared to the giants we have in Washington state. Another easy ride. We were glad to have a dry day and climb back into the mountains. The road wound through fantastic green hills and through a number of tunnels. 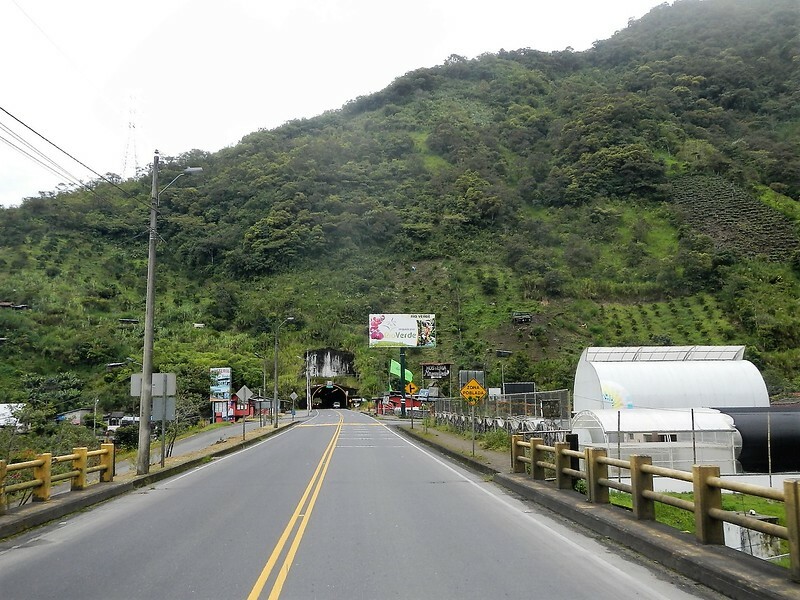 As we got closer to the touristy city of Banos the road followed Rio Pastaza that was down in a deep gorge. This is a beautiful place, we checked into a really nice hotel Hotel Samari, which turned out to be somewhat expensive but we managed to negotiate a good rate for two nights. Since we arrived early enough we ran into town to check it out. They had a really good market and we found ourselves sitting in the “food court” for dinner. We’ve learned that like most cities, the markets have these little food courts where there are small booths with usually 4 plastic chairs. We walked by one and this really nice lady waved us to her booth with a huge smile. Hungary and not able to say no we were soon seated while she cooked a meal in front of our eyes. 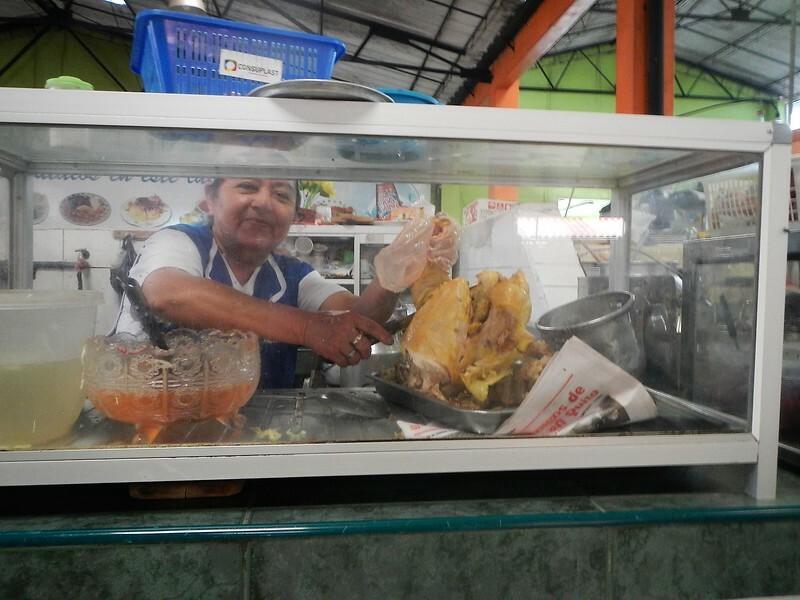 She even posed for a picture cutting the chicken. I wish it would have turned out better. We has a great meal, Deby had salad, fried mashed potatoes, chorizo and beets. I had about the same thing with some carne. We were both served some sort of drink out of a huge jug into stainless steel cups. It was actually really good. After she served us she grabbed a bowl of soup with a chicken foot peaking out of the broth and sat down to join us. The three of us sat and enjoyed our meals while conversing in sign language. I tried my Spanish but am pretty sure she was one of the many indigenous people of Ecuador that mostly speak Cuichua. Oh, the bill for all this? $5 USD. It was fantastic and seemed strange after shelling out over $150 for the hotel. Walking off dinner we went to the edge of town where there is a bridge across the river. 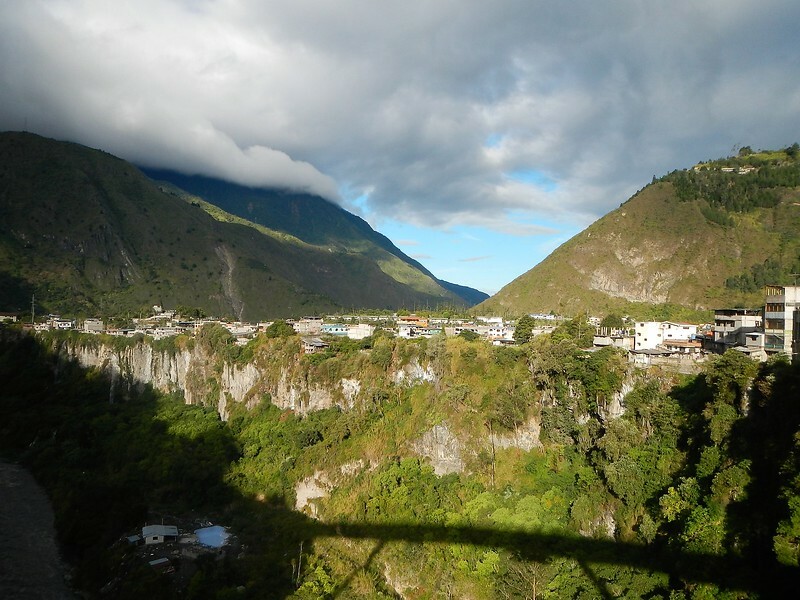 You can see in this picture the city of Banos is perched on a cliff along the deep river. 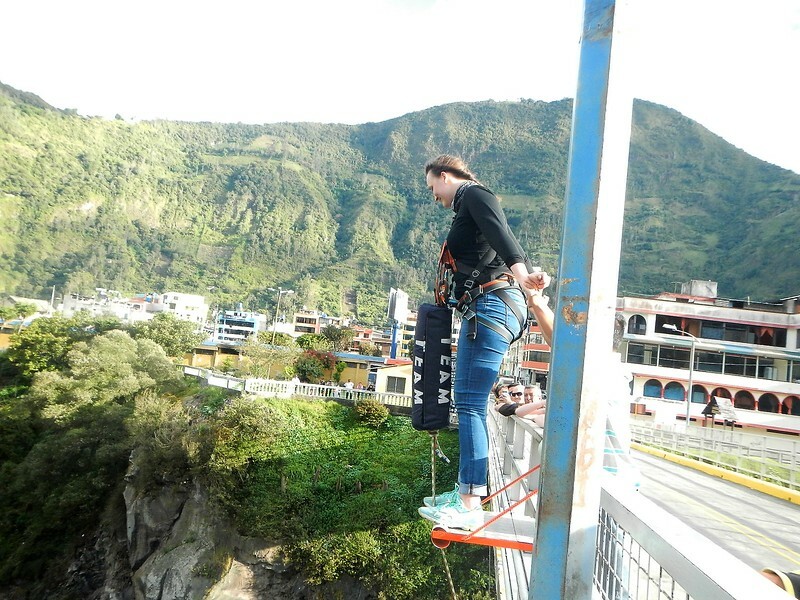 We saw some people gathered on the bridge so went to check it out….. evidently this is a good bridge to jump off of. We watched as a line of people prepared to jump one at a time. It looked like it was just a couple of guys with ropes that had set up shop on this bridge. I found out it was $20 for a jump….. um, no. I don’t know how many feet but it was a long way down. Back at the hotel we went for a walk and were amazed at the gardens, flowers and lushness of the surroundings. Ecuador is a small country. The last time we were here we rode through it in three days. 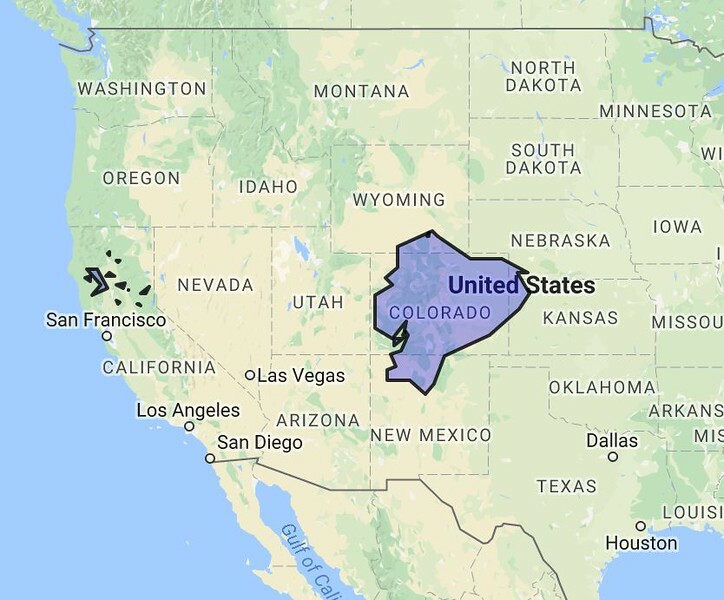 Here is a map for comparison. 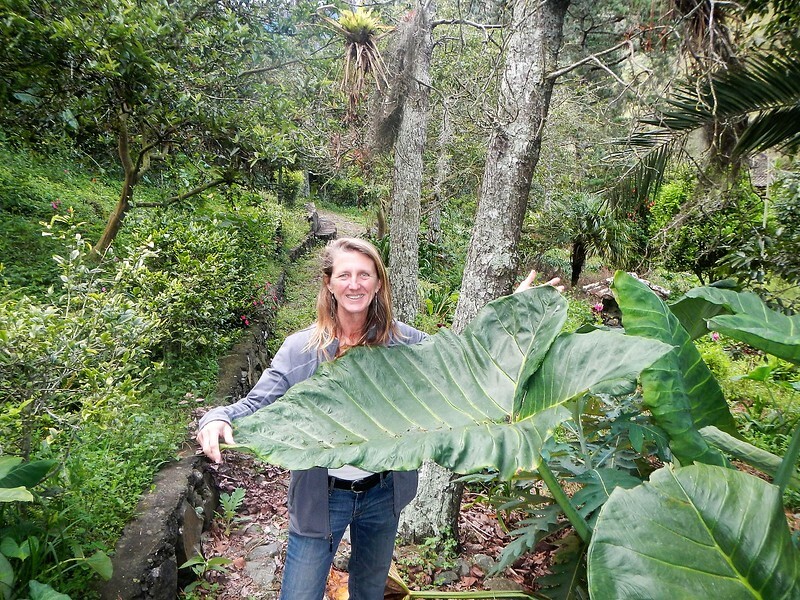 Our reservations for the Galapagos Islands is forcing us to slow down and enjoy the country. It’s easy to do since the country is easy going, clean, fairly well organized and beautiful. The currency is actually the United States Dollar, I’m not sure how or why but it’s convenient. The only downside is the everyday rain. The rainy season is supposed to be over but it’s not. Everyone here blames it on el nino. It comes and goes but seems to be following us around. Ok, we are used to it but are looking forward to some “island time”. That’s more like it! 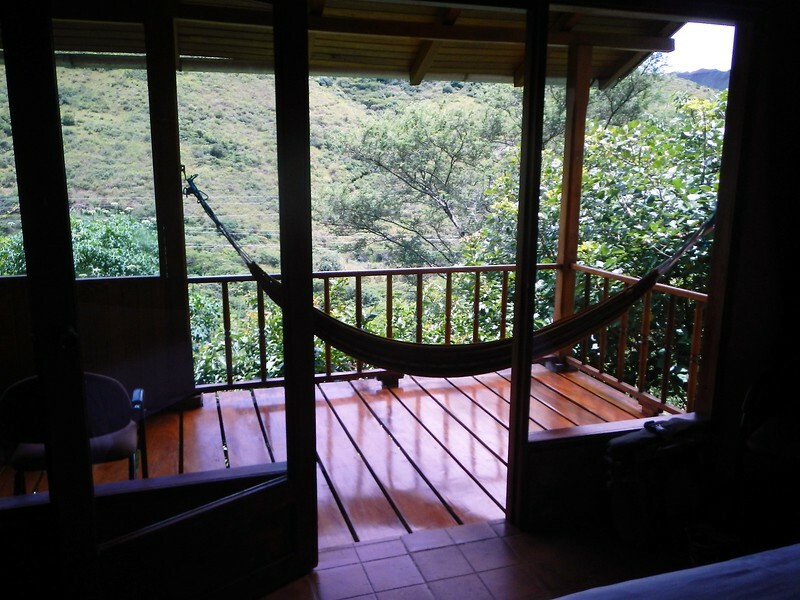 Really liked the views from that hotel with the hammock …. enjoy the Galapagos! Glad you got some relaxing time! I <3 the butterflies. 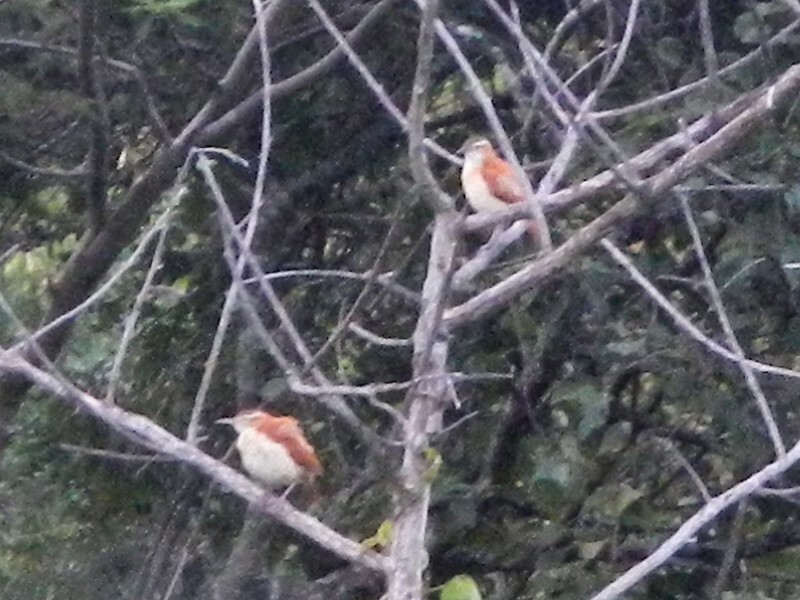 The news up here didn't cover the Peru flooding much, but they are covering the Colombia floods… Lots of pic's rom Galapagos, please! Have fun & stay safe. Love all the flora and fauna!! Hi, Turns out Snoqualmie has a sister city in Peru named Chaclacayo. Snoqualmie is gathering donations to help with the flood damage. When you came across the metal craftsman I think Deby may have made her exit regardless of whether the bus was still in motion. Hi Barbara, I didn’t know about the sister city thing. Chaclacayo is a little east of Lima, we didn’t go through it since we came from the south. 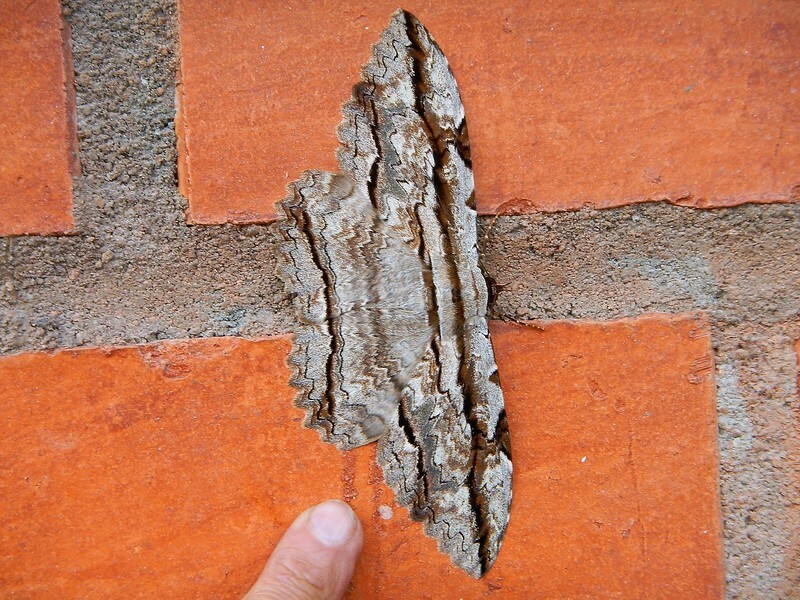 Yes, it’s really bad all around there. Glad to hear Snoqualmie is helping out. Really glad for the update . What a wonderful change of scenery! 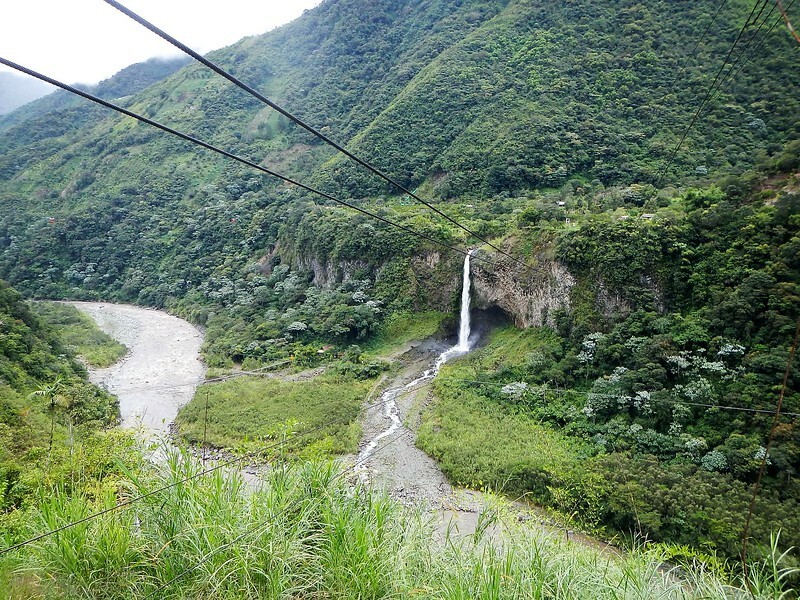 Bo and I did the zip line in Banos across the gorge and over the water falls. Enjoying your trip with you two! Hi Jeanne and Bo, Ha! 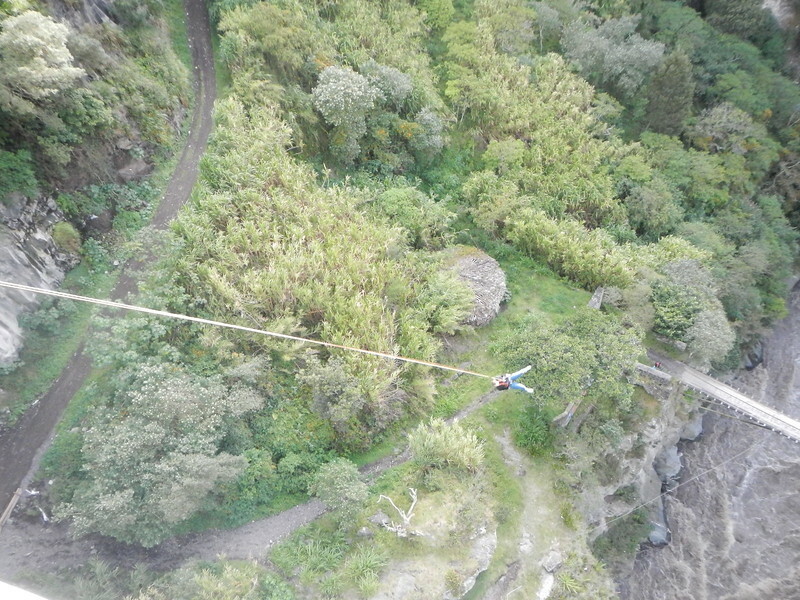 After reading this Deby and I went back and did the zip line! Fun fun fun. Thanks for the recommendation. We took a short ride today and it was chilly but so overdue. I’m so excited to see your pics of the Galapagos. I hope to go there one day. love following your stories. we are from Brazil and Germany and love to travel. you guys are an inspiration.